Whether you classify yourself as a devout day drinker or not, Tampa’s Gasparilla Pirate Fest welcomes all. From the pirate invasion, to the parade, to the daylong parties and performances, ye bound to have a good time. I mean, who doesn’t love another reason to put on a costume? The fest only happens once a year, but the party never ends thanks to Gaspar’s Grotto, Tampa’s notorious pirate bar & restaurant. With three bars in the same venue, the Grotto suits all needs – you can even get married there by the captain himself (unfortunately he wasn’t available the day I went with my boyfriend, probably for the best). But what we really needed the day after Gasparilla fest was B-R-U-N-C-H and boy did we find treasure. The Grotto offers a Sunday Booze Cruise Brunch which includes unlimited bloody marys, mimosas, and a ginormous buffet for $35. I’m from New York and I’ve been to many boozy brunches, and I can say the Grotto is unlike any I’ve been to before. First and foremost, there is no time limit. Second, you don’t have to wait for the waitress to come around to ask for your next drink. They supply you with a bottle of champagne and carafes of vodka and they continuously come around to restock before you’re even finished. If you’re not already enticed, wait until you see this buffet. We’re talking waffle station, omelet station, southern favorite’s like fried chicken, grits, mac n’ cheese, and of course a raw bar. Alongside the buffet there is a bloody mary and mimosa bar. My first trip inside I was very overwhelmed and took way more than I could carry comfortably, so I kept my first bloody simple with only three olives and a lime. Because you’re the one making your drinks, the quality of your bloody or mimosa depends on your bartending skills. BUT, I can say that Gaspar’s Grotto provides you with all that you would need to construct the ultimate bloody mary. They have about 7 different types of mixes, freshly cut veggie toppings, the raw bar, and for my fellow spice lovers, there are about 15-20 different types of hot sauces to choose from. Safe to say my boyfriend and I got our money’s worth. We arrived at Gaspar's Grotto at 10:30am and left at 4:00pm, five bottles of champagne, several bloody marys, and thousands of calories deep. I basically walked the plank to our Uber. And I forgot to include the shots of fireball that the DJ bought for the entire restaurant after he lost a game. The DJ brings the party, playing throwback hits for all ages and hosting games up on stage with bottle prizes for winners. As if this place couldn’t pop off any more, it’s outdoors and pet friendly. 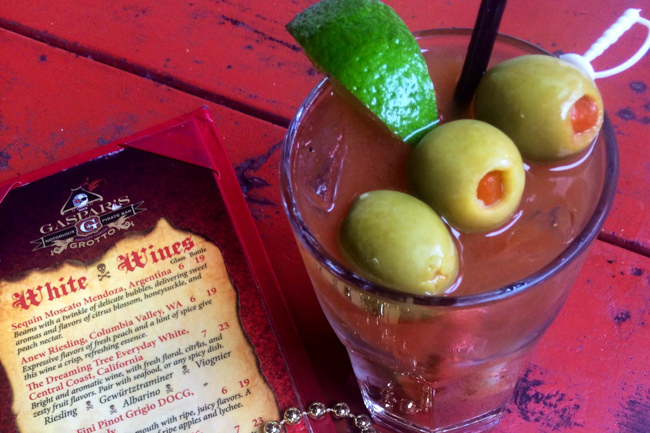 You can enjoy your bloody mary with some sunshine and the company of your furry friends. Why go? Enough food and alcohol to keep you full for a week for only $35 (seriously 3 days later and the bloat is still here). And if you’re not feeling the buffet, your bloody only costs $3. Life as a pirate is a bloody good time.